Purchase any of the eligible HP Printers between 8th April to 31st May 2013. Fill in the redemption form with your particulars. Every redemption form automatically qualifies as 1 contest entry for the G-Shock watch. OR submit your entries via HP Malaysia Facebook page on the "Notes" section and fill in your particulars. 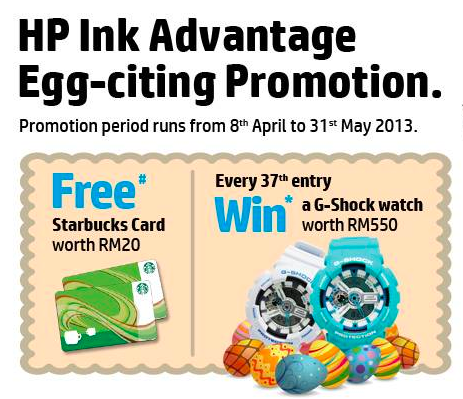 Visit HP Malaysia Facebook fan page for more details.